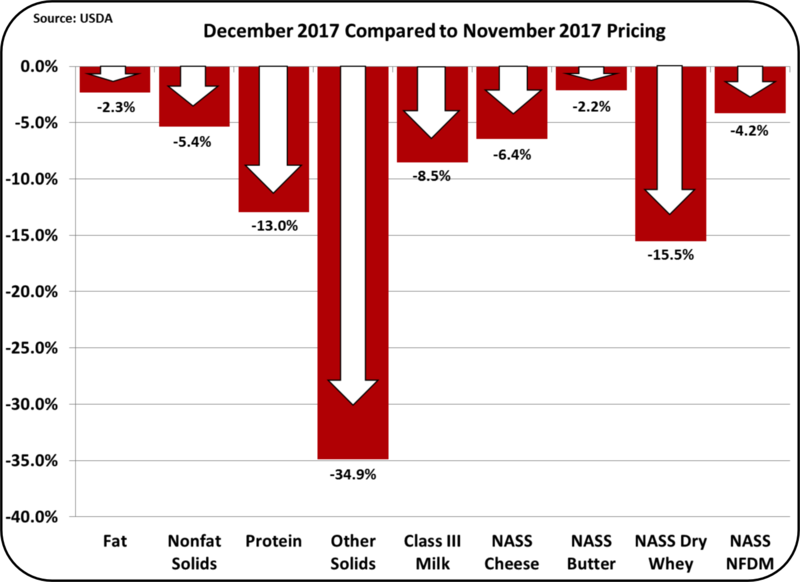 With the January 4, 2018 announcement of December Class and Component Prices, 2017 milk prices were completed. 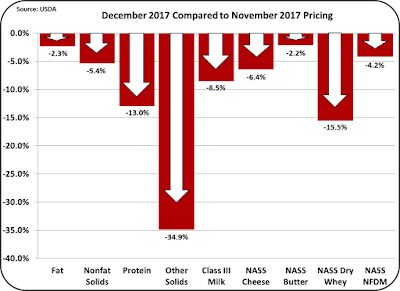 The prices for December were at or near the bottom of all 2017 prices. The Class III price was $15.44/cwt. There was only one month during the year that posted a lower price. As seen on the dashboard in Chart I, the losses were very widespread. Chart II below says the same thing in another way. The pie chart often used in this blog shows the makeup of the Class III price by component. The relative structure of the pie chart showed little change in December, because the pieces of the pie all shrunk. The overall Class III price dropped $1.44/cwt. The last row of the chart below shows which components contributed to the Class III price decline. The drop in the price of milk protein caused a $.90/cwt. decrease. The price of butterfat caused a $.21/cwt. drop, and "Other Solids" caused a $.33/cwt. decrease. Added together, they account for the $1.44/cwt. drop in the Class III price. 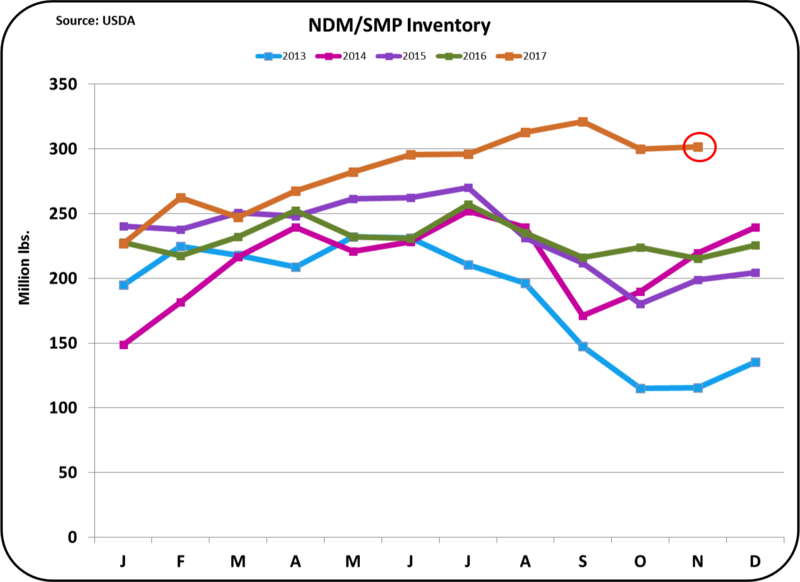 In some ways this could be characterized as the "perfect storm" of dairy prices. 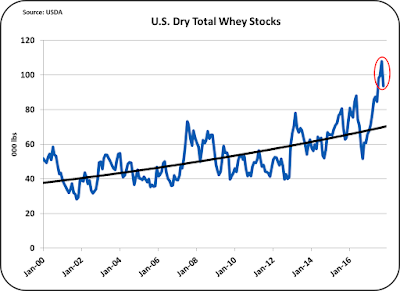 Percentage-wise, dry whey took the biggest price hit in December, falling 15.5%. This calculated to a 34.9% drop in the value of "Other Solids." 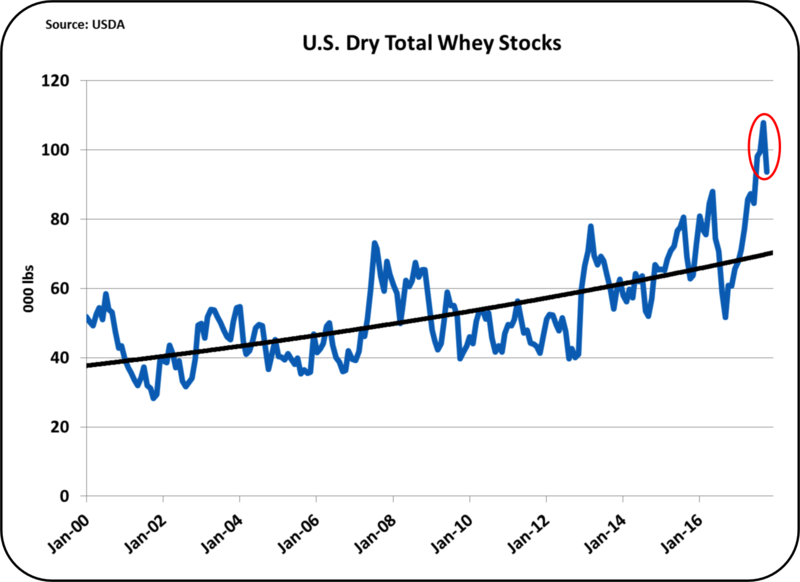 Chart III below shows the extreme nature of dry whey inventory. 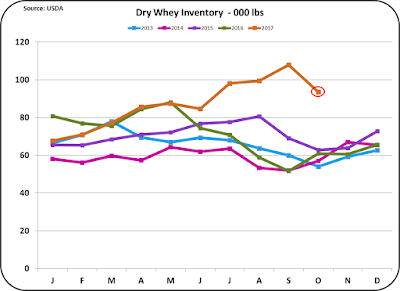 Typically, if there is not a sufficient market for dry whey, the whey is not dried and is disposed of at lower wet whey prices. This will probably be the fastest commodity to correct as less whey is dried. Therefore, look for "Other Solids" inventory and price to correct soon. As the world's population continues to eat more and more cheese, an equal growth in whey will occur. Where will all this whey go? Of course, pricing is typically impacted by high inventories. 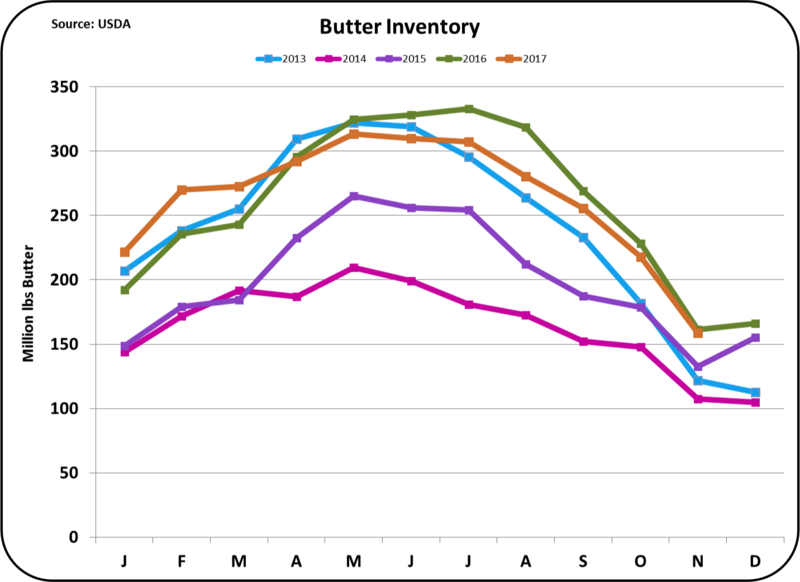 The most recent inventory levels shown in the charts IV through VII below are for the end of November. 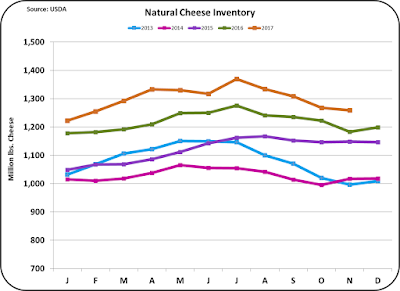 Cheese, Nonfat Dry Milk (NDM), and dry whey inventories were well above prior year levels. Exports, which will be covered in an upcoming blog, show export improvements in many of the commodities that are used to set producer prices. 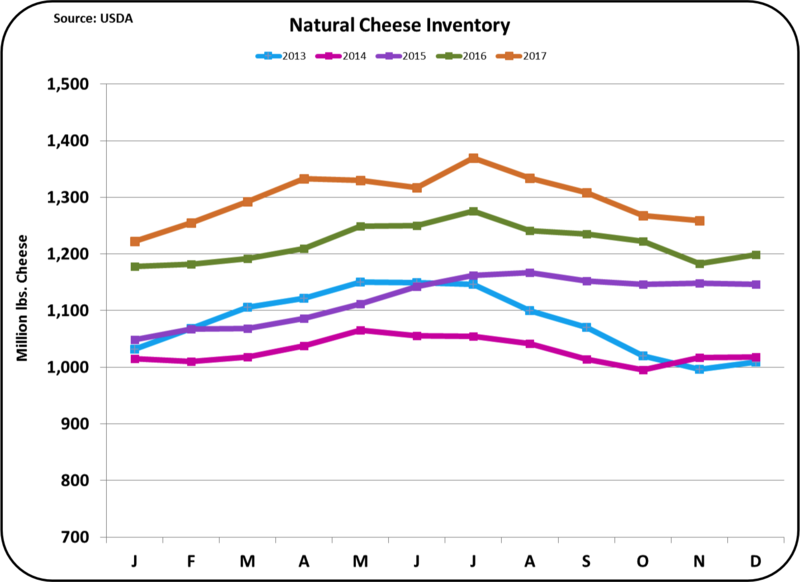 However as of now, cheese inventories are still high, butter inventories are "OK", and dry whey and NDM are extremely high. 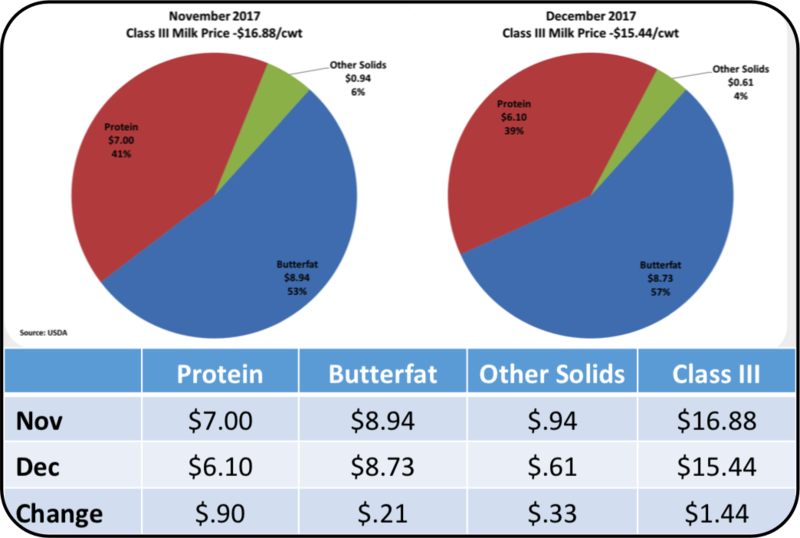 The butter price is the basis of the butterfat price, the dry whey price is the basis of the "Other solids" price, and The NDM price is the basis of the Class IV milk price. The formulas for pricing milk protein are based on the cheese price and the butter price. 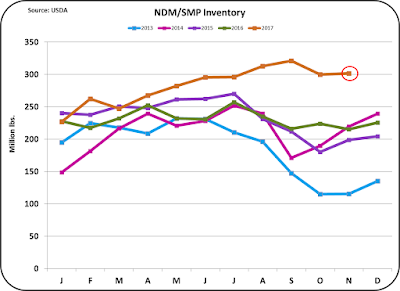 When the commodity inventories are high, prices drop and, by formula, the component prices drop. 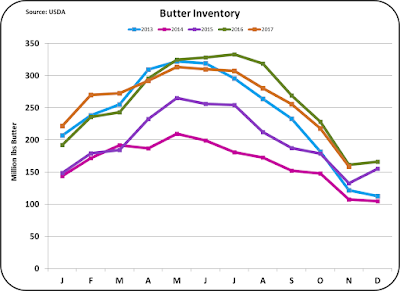 Butter inventories are the only inventories that are not high. The reason is simple. U.S. butter production has not kept up with increased demand. 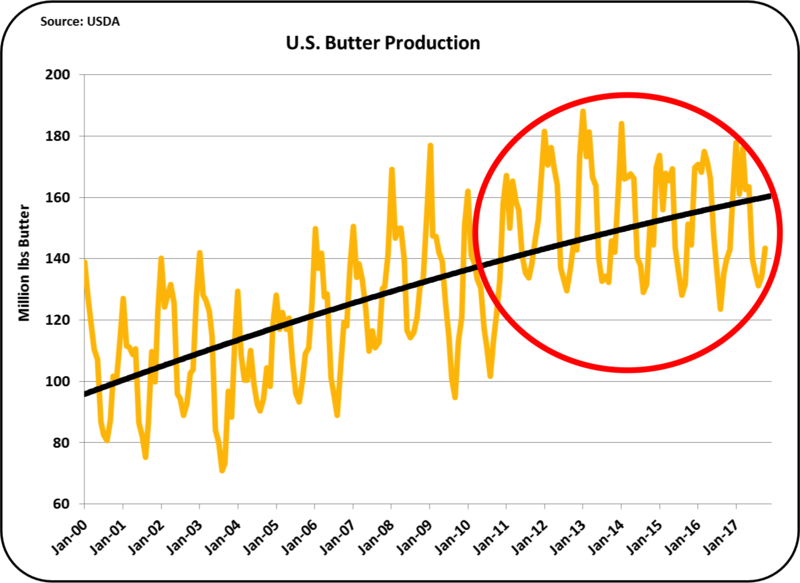 For the years from 2013 thru 2016, butter production declined. In 2017, there is a small increase. Through 2018 these trends will be followed and reported in this blog. Going into 2018, there is obviously a significant inventory issue. The inventories can only be reduced by significantly increased exports and/or reduced milk production. 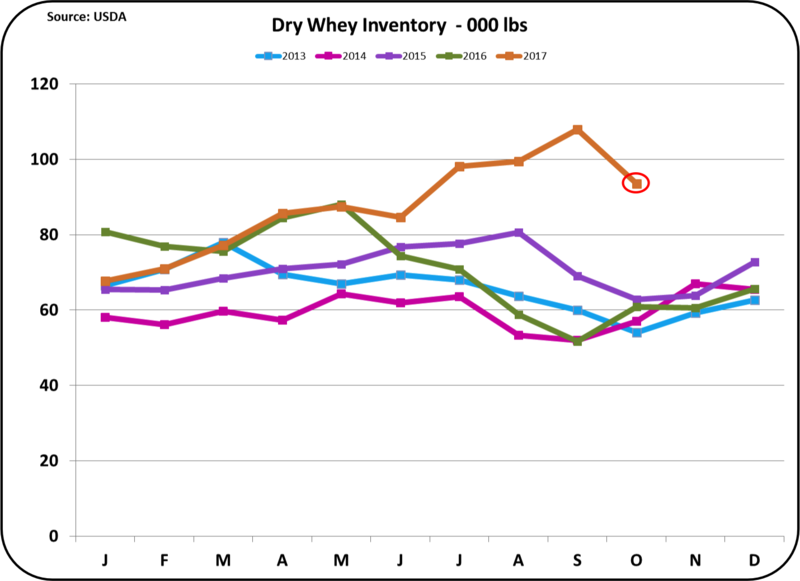 There is a new article in Progressive Dairyman by this author following the lines of the October 22nd and October 29th posts to this blog. The article is titled "Focus on Components to Increase Revenue and Profit." In that article, the economics of maintaining a consistent focus of components is quantified. In an upcoming post to this blog, quotes from some of the leading nutritionists will added to this dialog. Chasing the market doesn't work for financial management and it doesn't work for dairy production. More on this in a late January post to this blog.